The Safety Centre are pleased to introduce our range of Fire Exit Safety Signage. These signs are designed for positioning above Fire Exits or on escape routes and are designed to provide clear identification of evacuation routes within a building. For more information on Fire Exit Safety Signage call us NOW on 01200 428 410. These signs are available in a variety of sizes and also in a rigid PVC or self-adhesive vinyl version. 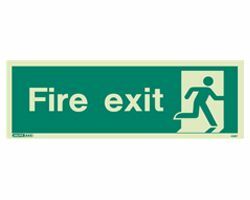 The range of Fire Exit Safety Signage from The Safety Centre includes the Jalite Photoluminescent range of signs. These signs are a glow in the dark type, where in the event of a lighting failure the signs will glow and still be visible. This means that the escape routes can still be visible even in pitch black conditions. The escape route direction within the building should be clearly labelled in order to aid in speed of evacuation of the building. If you’re interested in these products you may also be interested in our LED Emergency Lighting and Yuasa NP7-12 ranges.